Freestyle Releasing opens Go For Sisters in select theaters on November 1st, 2013. NYC MOVIE GURU: Do you think it's fair to classify Doonby in a genre? WW: It's a little bit of everything you said. I wouldn't classify it in one particular genre. It's a story unlike any other story. It's somewhat along the lines of J. B. Priestley's play An Inspector Calls. I wouldn't know where to classify that, either. Maybe calling it a mystery/drama with an interesting message would be the closest way to describe Doonby. NYC MOVIE GURU: How important do you think it is to leave room for interpretatin? WW: Doonby leaves a lot of room for interpretation. The ending raises a ton of question. The best way to send the message that it sends is by provoking thought and discussions that come from it. During shooting, we all had different interpretations. John Schneider and I got into many conversations about the differences in our characters. He had a theory that his character and mine are the same person. That opened up a whole new can of worms. NYC MOVIE GURU: At heart, are you truly a small-town or big-town guy? WW: My heart is in the small town. My work, at least in this point in my career, calls me to still be in the Los Angeles area. We live on the nature preserve about 40 miles from L.A. We do get a taste of small-town life, but I guess I hope to be at a point where I can work and live in a small town. I idealize a little house on the lake with the kids fishing. NYC MOVIE GURU: Do you think Doonbu would work in black-and-white? WW: I've always been a fan of black-and-white films. I never thought of Doonby in black-and-white. All the flashbacks are desaturated and seem almost black-and-white. Interestingly enough, when things are good for Doonby in the film, maybe there's a purpose to the use of color. 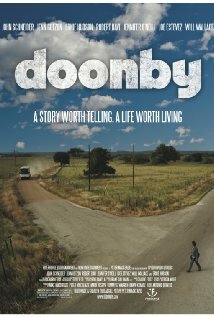 NYC MOVIE GURU: Do you think it's best to see Doonby with or without knowing a lot about its plot? WW: It seems like there are pros and cons to both. When there's no advertising budget, we need to first get people to theaters and might need to reveal some spoilers to tap into the potentional subject matter. If you don't know anything about the film and recognize the shock at the end, it's certainly going to be more effective if you don't see it coming. NYC MOVIE GURU: Which actor from the Golden Age of American Cinema do you imagine in the titular role of Sam Doonby? NYC MOVIE GURU: Do you think that there's a shortage of movies for adults these days? Will Wallace: I can't tell you how strongly I feel about that! I hear a lot of people saying that they're tired of seeing the same-'ol big-budget movies that could be turned into video games. We need them to go see the films that have heart if you want indie movies to continue to play in theaters. Often times, we don't have the big studio advertising budget, so we're strictly word-of-mouth.